When it comes to Candy Hearts' open-book policy, that book is essentially a diary. Since conceiving the band while attending college in upstate New York in 2010, frontwoman Mariel Loveland has used the band as an outlet to vent her feelings and frustrations in honest and relatable ways by way of familiar imagery and revealing, recognizable failings of short-term romance, empathetic tragedies channeled through '90s alternative-soaked pop-rock. It's a maneuver fully realized on their sophomore full-length, All The Ways You Let Me Down. "This album really spans the whole spectrum of a relationship," says Loveland, "from being single and looking for somebody, to finding someone and then breaking up." All The Ways You Let Me Down details the trek, pinpointing the highs like building emotional bonds during car rides ("The Dream's Not Dead", "Brooklyn Bridge") as well as the lows of unsureness and/or desperation that comes with any escalating relationship ("Michigan", "Coffee With My Friends", "Playing With Fire"). "Coffee With My Friends" and "Playing With Fire" also highlight the relationship one develops with themselves, a theme that subtly inflects "The One To Get Me Out" and other moments on the album. 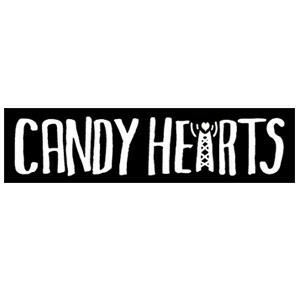 While coming off emotionally wounded, occasionally downtrodden and heavily introspective, Candy Hearts currently filled out by bassist John Clifford and drummer Matthew Ferraro, have always bundled these sentiments with hook-filled, bubbly, poppy inclinations. "It's a cool vibe for me," Loveland says of All The Ways. "It definitely has a more alternative and pop vibe than our last EP [2012's The Best Ways To Disappear]. It feels like Taylor Swift meets the Breeders, and that's something we were always going for. It's a lot less pop-punk; it's just like a straight-up pop-rock record." New Found Glory guitarist Chad Gilbert, who took on the band a couple years ago after overhearing their music from a bandmate on NFG's tour bus, has helped polish these intentions as producer for All The Ways You Let Me Down (as well as The Best Ways). He's also helped expose the band to broader audiences, handpicking them as the first act on his Bridge Nine imprint, Violently Happy Records, and taking them on a couple tours, including the upcoming UK Pop Punk's Not Dead run in the fall. "It's always really great when we work with him," Loveland says. "We have a good vibe together. He really understands what we're going for, musically. There are no arguments, and he definitely helps bring out the best parts of songs and shape them to be something that is definitely more catchy." A cameo from Jordan Pundik on "Something's Missing" also provides a pleasant collaboration between the bands, especially with the NFG frontman acting as an influence on Loveland's musical upbringing. "I was psyched," Loveland says of Pundik's vignette. "There are only a couple singers (the Beatles, Alanis Morissette) when I was younger where I was like, 'Man, that is something amazing.'" 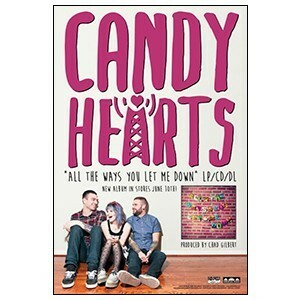 Although Loveland says she would love for millions of people the world over to hear and buy All The Ways You Let Me Down, she does so with a laugh, aware of the struggle it takes to gain as much fame as Candy Hearts' pop-rock predecessors and peers. However many people hear it, though, she'll ensure that the message is still as clear and honest as possible to both fans and themselves. "I've always wanted this band to be completely true to ourselves," Loveland says, "That's just what our band has always been about."